End tables are the secret ingredient that pulls together an entire room’s décor. Our Mission end tables make a great addition to your living room or family room, and they provide the ultimate combination of form and function. 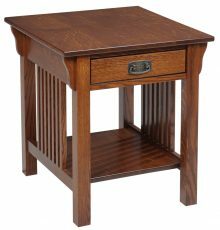 Even though our Mission style end tables are available in a variety of styles and designs, they’re all constructed according to traditional Mission practices that originated in the late 19th century. The Mission style is identified by its simplistic use of straight lines and flat panels the accent the natural grain of the wood. We use the highest quality hardwoods in the production of our end tables to ensure lasting durability. The classic yet modern design of Mission end tables will complement your existing furniture, but they also pair well with our Mission coffee tables, bookcases and more. 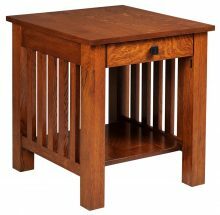 AmishOutletStore.com offers Mission style end tables in a variety of wood types and stain colors. 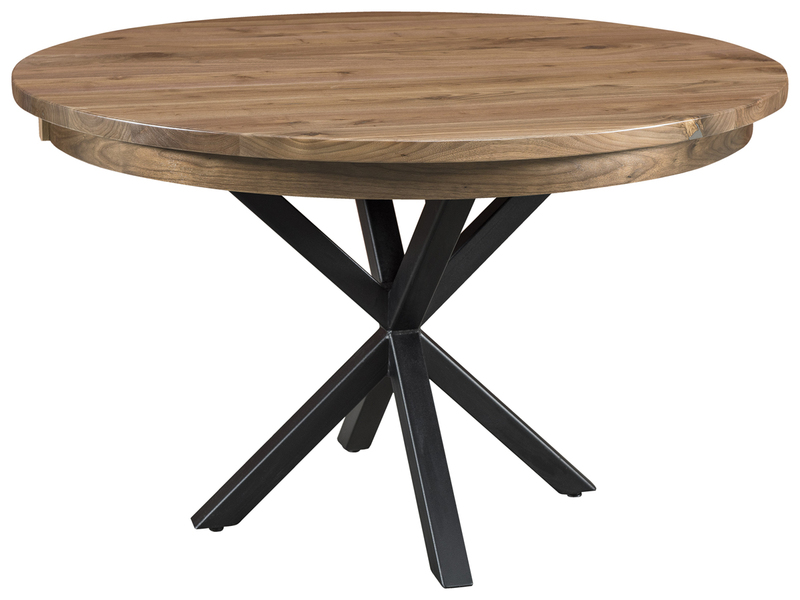 Most end tables are offered in oak, cherry, Q.S. white oak and maple, and these wood types can be stained in a variety of colors. You may prefer a lighter stain if your room has dark paint, or a darker stain if your existing furniture is made of dark-colored wood. Our Mission end tables are also available in several shapes and styles. We have round, square or rectangular end tables in variations with or without drawers, as well as both open- and closed-bottom designs. We also have nesting end table sets that conveniently store within each other to save space. 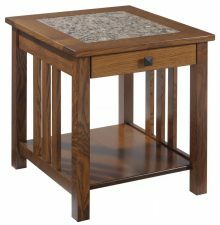 Surely, you’ll be able to find a Mission end table that fits your style and complements your home’s décor. 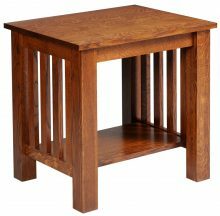 When you buy Mission end tables from AmishOutletStore.com, you can be assured you’re getting the best value for your money. 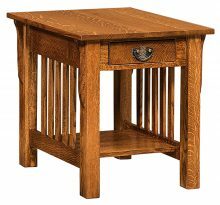 The combination of durable hardwoods and the superior craftsmanship of our Amish crafters results in heirloom-quality furniture that will last for years to come. 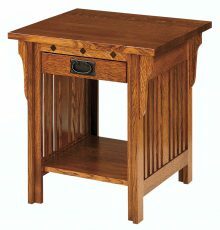 Purchase a Mission end table from AmishOutletStore.com today and get up to 33% off the regular retail price!